Commonest type of Gastro esophageal junction growth in our region is type III with involvement of the cardia. After resection with adequate margin, the length of the stomach tube might not reach the neck. In such situations Ivor-Lewis Esophago- Gastrectomy with intra thoracic anastamosis is a good alternative. Methods: A retrospective analysis of 13 patients with Gastro esophageal junction cancer was performed. Laparoscopically the stomach was mobilized preserving the right gastro-epiploic vessels. Lymph nodes along all named vessels were removed. Greater curvature tube is formed ensuring a distal margin of 5 cm. The esophagus is transected 10 cm proximal to the GE junction. The stomach tube is sutured by loose stitch to the hiatus. The specimen is extracted through a Pfannenstiel incision. Patient was then placed in prone position and through a right thoracoscopic approach, the cut end of the esophagus was further moblised till the azygos vein. Further 5 cm of the esophagus was cut and removed in a endobag through the 12 mm port site. 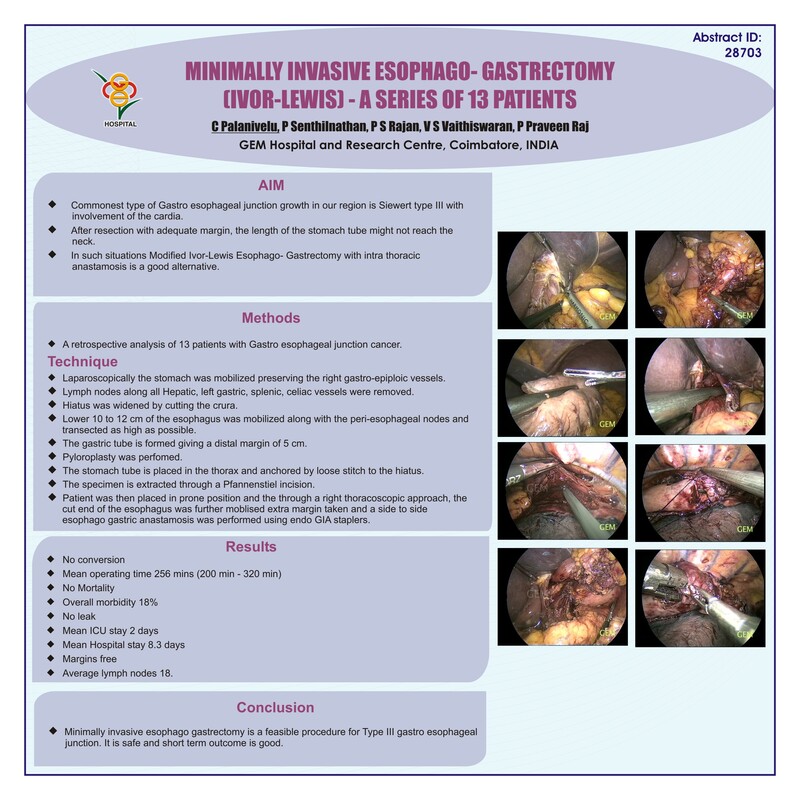 A side to side esophago gastric anastamosis was performed using endo GIA staplers. All 13 surgeries were completed successfully by minimally invasive technique. Mean operating time was 256 min (200 min- 320 min). No mortality. Overall morbidity was 18%. There were no leaks in the post operative period. Mean ICU stay was 2 days and mean hospital stay was 8.3 days. All margins were free. Average number of lymph nodes dissected was 18. There was no stricture in any of these patients.